As of late, I’ve become a HUGE fan of the Tiny House or Tiny Home movement sweeping the country. In case you hadn’t heard, tons of people across the U.S. are ditching “the American Dream” which has become the American Nightmare for many – a big house in the suburbs with a big mortgage – and moving into these Tiny Homes, which are exactly what they sound like: Tiny Houses typically between 100sf and 500sf (but I’ve seen them both smaller and bigger than that, but you get the idea). I’ll be honest, at first, I thought it was a joke; at best, just a way for people to be different and stand out from the crowd, more a way of expressing themselves than a way of life. But then I went to visit my friend Linda in Idylwild, California not too long ago – a small town in the mountains away from the lights and noise of cities like Los Angeles and San Diego. Could you see yourself living in a space like that? Because a lot of people across the country are now living in spaces about that big full-time – some a little bigger, some a little smaller – and for all different reasons. I had been tinkering with similar ideas over the past several years, talking about selling my house and getting away from a mortgage and the hassle of mortgage companies and banks (I’ve been involved in real estate and real estate finance for 10 years now…). And while the idea and simplicity of renting can sound appealing, I’d prefer still more control and the ability to change things and not be limited by what I can and cannot do. I guess it really comes down to a sense of freedom and independence. For others, its a way to also cut costs. In many markets around the country, a lot of people are simply priced out of the mainstream property market but still want to own their own home. And that’s where a Tiny Home – whether that’s a floating house boat on the riverbanks of Portland, Oregon or on a float in close proximity to downtown Seattle, or a 500sf top of the line, fully kitted-out and off-the-grid home high up in the scenic Rocky mountains, or a very space-efficient tiny home built on a double-axle 8×20 trailer that can be towed to different locations around the country – really starts to make sense. 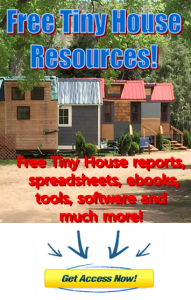 Tiny Homes come in all different styles, types, shapes, costs, and mobility options. I’ve seen people build their own tiny home on a double-axle or 5th wheel trailer (fully functional with kitchen and bathroom, with water and power options) for $30,000. Then there are other permanent-type Tiny Homes that you can find in communities in Jackson Hole, Wyoming that start at $300,000 for around 250sf. And a whole lot in between. Myself, I live in a 4 bedroom, 2 bathroom 1550sf home and I never use my dining room, hardly ever use the living room even, don’t need a 2nd bathroom, don’t use the guest room on a regular basis nor the study all that often. I realize I could quite easily downsize into a home easily 1/3 this size and still be able to maintain the same way of life I do today – but with 1/3 (or less) the cost, hassle, inconvenience, stress, energy, etc that it takes to maintain my home currently. And to be honest, from what I’ve seen, I believe I could design a tiny home to be twice as functional as the space would make you think. So what really would I be losing? I think another part of my skepticism or resistance to the idea was the thinking that I was cutting back, or having to give up something and drastically alter my quality of life, which I didn’t want to sacrifice. If anything, I want to improve my lifestyle or quality of life, not the other way around. But again, when you take the time to design and engineer every little space and utilize the latest technology and gadgets, you can actually end up creating MORE not less. In watching shows like Tiny House Nation, Tiny House Hunting, Tiny: Living Small, the documentary Tiny, etc (there’s a ton of shows out there about it, even shows on-demand thru Dish Network) I began to see how powerful that space could be. You really can do a lot with a small space with some smart planning ahead of time. I don’t know if you can tell, but I’m sold! Every night I find myself watching an hour of one of these shows and going to sleep dreaming about the different possibilities. Not sure if I want to build myself a nice tiny home in the rockies with all the latest technology and appliances and go off-grid or build a smaller tiny home on double-axle trailer and continue to travel even more around the country and staying for a few weeks or months a time before taking my home to the next location.